We stayed in Paradise RV Park. This was our first encounter with a self service park with no reservations. The owner had insured us that this time of year it would not be crowded but we were still a little nervous. It all worked out! We drove up and picked out our spot on the hill and then filled out the registration form and slipped it under the door with our check. It only cost $100 a week, the cheapest site so far! Chris said he sees why but I overlooked all that when I saw the 360 degree views of the surrounding mountains with the most beautiful sunsets every night. I think they should charge more just for the views. Maybe they could use the money to fix up the playground. The park is located in Panquitch, UT which is 25 minutes outside of Bryce Canyon National Park. We chose this location because it’s proximity to Bryce Canyon and it’s in the middle of Zion and Capitol Reef National Parks. Each of those is 2 hours away; Zion to the south and Capitol Reef to the East. Next week we move to Arches National Park where we will also visit Canyonland National Park. All 5 of these parks make up the Mighty 5 of Southern Utah. I will post Bryce Canyon on this post and then post each of the other parks separately. I was excited to see Oak, Maple and Aspen trees here in Utah because the leaves have started changing colors! I love the fall colors! The Quaking Aspen Tree is Utah’s state tree and my new favorite tree. I splurged and bought myself a pair of real aspen leaf, dipped in 24kt gold, made into earrings at the Bryce Canyon Lodge. From the fluorescent yellow colors their leaves turn in the fall to the white bark with beautiful black scars where they have self pruned to the fact that they spout out of the family root system make them fascinating. Pando, also known as the Trembling Giant, is a clonal colony of an individual male Quaking Aspen determined to be a single living organism by identical genetic markers and assumed to have one massive underground root system. The plant is located in Fishlake National Forest. Pando occupies 106 acres and is estimated to weigh collectively 6,600 tons, making it the heaviest known organism. The root system of Pando, at an estimated 80,000 years old (some tree experts claim it is over 1 million years old), is thought to be the oldest known living organism. Still loving the National Park entrance signs! Some of them even have camera stands now! 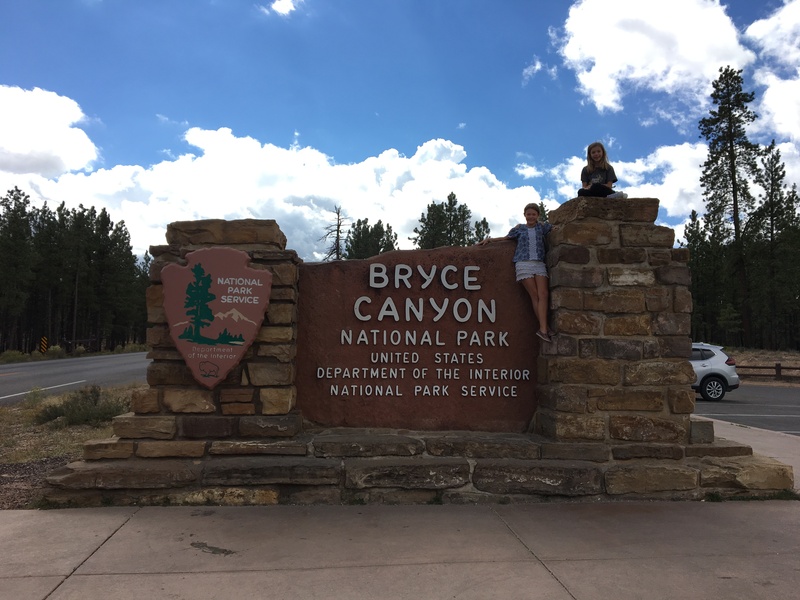 The girls and I drove into Bryce Canyon on Monday to get a lay of the land, get passport books stamped, pick up maps and the Junior Ranger booklets. We learned that they also have a shuttle bus system like Zion but this one is not mandatory so we chose to drive around and check things out in the Jeep. Our first stop was Sunrise point, we did a quick walk along a paved path to catch the views. It was like walking up to the rim of the Grand Canyon and seeing it for the first time. You park among pine trees and then walk to the opening. WOW! There is a general store at this parking lot which have the most amazing cheese breadsticks we’ve ever had! The rim of Utah’s high plateau has pastel-colored stones called hoodoos. They are white, pink, and red. Bryce Canyon is known for the Hoodoos (irregular columns of rock). They exist on every continent, but here is the largest concentration found anywhere on Earth. Situated along a high plateau at the top of the Grand Staircase, the park’s high elevations include vast wildlife, fantastic dark skies, and geological wonders. The next day we waited for Chris to get done with work and took him to the park for the first time so we revisited Sunrise point to hike Queen’s Garden trail. This trail starts at Sunrise point and takes you down to the bottom of the canyon, descending 320 feet. You will see many hoodoos, representing flowers and plants in a garden. We tried to imagine Queen Victoria in this hoodoo at the end of the trail but just didn’t see it. The girls did find a hidden rock painted with the Flash symbol. We took it to Arches and hid it there. We drove over to Inspiration Point and then to Bryce Point to watch the sunset. The pictures don’t do it justice. Thursday we waited until the late afternoon and headed back to hike the Navajo Loop Trail to see Thor’s hammer and Wall Street. You can combine the Queens Garden trail and the Navajo Loop all in one trip because they connect with a short 0.8 mile trail. We split it up because we are limited to daylight hours when we do family hikes because of the sunset setting early. After hiking them both, I would still suggest hiking them separately so you can see ALL of the Navajo Loop. Wall Street with it’s narrow slot canyons is not to be missed. We walked over 3 miles among the HooDoos so we earned a special “I hiked the Hoodoos” sticker that we picked up when the girls turned in their Junior Ranger badges. The last day we drove the 18 mile scenic roadway all the way to the end at Rainbow point. We stopped at the Natural Bridge pull out on the way out to Rainbow Point. Highlights of Bryce Canyon are the Amphitheater, hiking Queen’s Garden, and walking through the pines at the bottom of the Navajo Loop. We attended an astronomy ranger lead program and learned all about Cassini and it’s final days around Saturn. After the program we went Star gazing through park telescopes in one of Earth’s best dark skies areas. We were able to see binary stars, a star cluster, and Saturn through the telescopes. While we stood in lines waiting for our turn to peek into the galaxy, we enjoyed pointing out constellations. We don’t have any pictures because we were part of a ranger program that restricted any white lights at all. I borrowed this photo from skyandtelescope.com of what Saturn looked like through the telescope that evening. NASA’s Cassini spacecraft made its final approach to Saturn and dove into the planet’s atmosphere on Friday, Sept. 15. It had been launched in 1997 and entered orbit in 2004 where it started collecting data about Saturn and it’s rings. RIP Cassini.